Imagine that you wake up one morning to the shrivel sound of a small voice, crying as though someone knocked its little head against a hard wall. Aghast with utter dismay and a little bit of shock you suffer yourself and drag your still too tired feet out of bed; you proceed straight to your sun-lit porch, ignoring the shining rays of the already too bright sun. Then you see her, the baby. She’s hidden in the moistness of the grass outside your window, kicking and screaming at the top of her lungs. “Who would have done such a thing?” you silently ask yourself, secretly cursing the mother of the child. And so you put on something more than just your boy shorts and start running down the spiral staircase. Immediately you see her you stop on your tracks, wondering if this whole drama is even real. But then she cries again, and your heart does a double flip because something in you is unraveling. With the love of God invested in you, you carry this child and hold her close to make her stop crying. And then you notice her eyes…such beautiful brown eyes. You start to notice other things too, like the way her hair curls to the tip of her neck…or even the way her mouth starts to curve into a smile. And that’s just it for you. Gosh, is she beautiful? Another beautiful child has been born, here and now, in this very moment. Another child with great talent to give to the world. Another Bill Gates, or another Obama. Another Ghandi or another Ralph Waldo Emerson. Another Abraham Lincoln or another Nelson Rolihlahla Mandela. You wouldn’t know yet unless you see her grow. You wouldn’t know yet, would you? Gone are the days when we said “the beautiful ones are not yet born,” for they are within our midst today. Yes, the beautiful ones are you and I. If you don’t believe it, look at yourself. The funny thing is that we are born in every single generation. I am always wowed when I read your posts!!! "God don't make ugly"!! !I love that statement...you bet I'll be using it in the nearest future...brilliant!!! 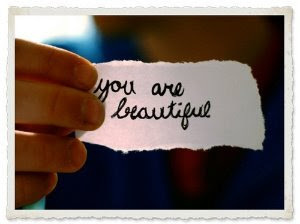 We are all beautiful in our own different ways...we've just got to start believing it...!!! I needed this..and then I mulled over *God don't make ugly* and I'm realizing WE ALL are beautiful (not just me) cos really d guy doesn't do ugly>>>>> FEARFULLY AND WONDERFULLY MADE!!!! wow....He has made all things beautiful in its time -- hard to accept often everything has a perfect timing...And God makes it happen.. He has made everything beautiful in it's time...I never saw it from this point of view. This is really beautiful. and then the crowning verse from Ecclesiastes... thanks for this post. you should put your name up there too. I am indeed a work of art, a sight to behold, a beuteous thing. Wow I didn't realise I radiated so much beauty all to the glory of God. Thank you Jesus for the life that you have taken you time to create in me. Yes indeed God don't make ugly and we are all beautiful in different ways. I believe it! I loved this post it is so on point. especially for us females who easily get insecure about something (oops! is that just me?!). 'God don't make ugly' - Now ain't that the honest truth!! long time since i'v been here! feels like a warm hug( in my mind!lol). Miss Iyabo...seriously. I think the reason most people don't believe it is that they really don't know who they are. If we really understand who we are as individuals, and what our purpose on earth is for, then maybe we would start to see why we are beautiful. Lolia...the getting hurt part, yeah that happens. I guess that's why we cannot accept what people tell us all the time. A true friend will tell us maybe how to correct a make-up flaw, or how not to leave our bras showing, or what hair-styles would look better on us (as women~for men what better hair-cuts)...but they should never ever say that you're ugly. Because in actuality, beauty always shines. Danny Bagucci...Yes, it is hard to accept. But if we make up our minds to accept it, it will ultimately be easy. How are you? Afrobabe...I already knew that...or else all those numerous dudes won't be chasing you all around town...lol. Robyn...you've come again o. Lol...Mr. Poet. Okay, I'm flattered. Lol. The Life of a Stranger...we can't even thank God enough. Maybe that's why the Psalmist had to ask God, "what is man that You are mindful of him?" Olufunke...yes, you definitely are. Look at your beach picture na...lol. The Poet's Voice...Amen. Thank you (and I did have a beautiful weekend). Chichi...don't worry its not just you...lol. Feel free to add me to the list. I've got freckles and pimples I constantly worry about...and errmmm...others. But sha, I am beautiful. Lol.